Despite the merit of managing natural resources on the scale of ecosystems, evaluating threats and managing risk in ecosystems that span multiple countries or jurisdictions can be challenging. This requires each government involved to consider actions in concert with actions being taken in other countries by co-managing entities. 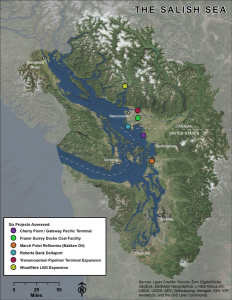 Multiple proposed fossil fuel-related and port development projects in the Salish Sea, a 16,925 km2 inland sea shared by Washington State (USA), British Columbia (Canada), and Indigenous Coast Salish governments, have the potential to increase marine vessel traffic and negatively impact natural resources. There is no legal mandate or management mechanism requiring a comprehensive review of the potential cumulative impacts of these development activities throughout the Salish Sea and across the international border. This project identifies ongoing and proposed energy-related development projects that will increase marine vessel traffic in the Salish Sea and evaluates the threats each project poses to natural resources important to the Coast Salish. While recognizing that Coast Salish traditions identify all species as important and connected, we used expert elicitation to identify 50 species upon which we could evaluate impact. These species were chosen because Coast Salish depend upon them heavily for harvest revenue or as a staple food source, they were particularly culturally or spiritually significant, or they were historically part of Coast Salish lifeways. We identified six development projects, each of which had three potential impacts (pressures) associated with increased marine vessel traffic: oil spill, vessel noise and vessel strike. Projects varied in their potential for localized impacts (pressures) including shoreline development, harbor oil spill, pipeline spill, coal dust accumulation and nearshore LNG explosion. Based on available published data, impact for each pressure/species interaction was rated as likely, possible or unlikely. Impacts are likely to occur in 23 to 28% of the possible pressure/species scenarios and are possible in another 15 to 28% additional pressure/species interactions. While it is not clear which impacts will be additive, synergistic, or potentially antagonistic, studies that manipulate multiple stressors in marine ecosystems suggest that threats associated with these six projects are likely to have an overall additive or even synergistic interaction and therefore impact species of major cultural importance to the Coast Salish, an important concept that would be lost by merely evaluating each project independently. Failure to address multiple impacts will affect the Coast Salish and the 7 million other people that also depend on this ecosystem. These findings show the value of evaluating multiple threats, and ultimately conducting risk assessments at the scale of ecosystems and highlight the serious need for managers of multinational ecosystems to actively collaborate on evaluating threats, assessing risk, and managing resources.